Learn how and when to use the architecture-slash-design pattern of MVVM in this free chapter from our new book, Design Patterns by Tutorials! This is an excerpt taken from Chapter 10, “Model-View-ViewModel” of our book Design Patterns by Tutorials. Design patterns are incredibly useful, no matter which language or platform you develop for. Every developer should know how to implement them, and most importantly, when to apply them. That’s what you’re going to learn in this book. Enjoy! Models hold application data. They’re usually structs or simple classes. Views display visual elements and controls on the screen. They’re typically subclasses of UIView. View models transform model information into values that can be displayed on a view. They’re usually classes, so they can be passed around as references. Does this pattern sound familiar? Yep, it’s very similar to Model-View-Controller (MVC). Note that the class diagram at the top of this page includes a view controller; view controllers do exist in MVVM, but their role is minimized. Use this pattern when you need to transform models into another representation for a view. For example, you can use a view model to transform a Date into a date-formatted String, a Decimal into a currency-formatted String, or many other useful transformations. This pattern compliments MVC especially well. Without view models, you’d likely put model-to-view transformation code in your view controller. However, view controllers are already doing quite a bit: handling viewDidLoad and other view lifecycle events, handling view callbacks via IBActions and several other tasks as well. This leads what developers jokingly refer to as “MVC: Massive View Controller”. How can you avoid overstuffing your view controllers? It’s easy – use other patterns besides MVC! MVVM is a great way to slim down massive view controllers that require several model-to-view transformations. Open IntermediateDesignPatterns.xcworkspace in the starter directory, and then open the MVVM page. Here, you define a model named Pet. Every pet has a name, birthday, rarity and image. You need to show these properties on a view, but birthday and rarity aren’t directly displayable. They’ll need to be transformed by a view model first. First, you created two private properties called pet and calendar, setting both within init(pet:). Next, you declared two computed properties for name and image, where you return the pet’s name and image respectively. This is the simplest transformation you can perform: returning a value without modification. If you wanted to change the design to add a prefix to every pet’s name, you could easily do so by modifying name here. Next, you declared ageText as another computed property, where you used calendar to calculate the difference in years between the start of today and the pet’s birthday and return this as a String followed by "years old". You’ll be able to display this value directly on a view without having to perform any other string formatting. Finally, you created adoptionFeeText as a final computed property, where you determine the pet’s adoption cost based on its rarity. Again, you return this as a String so you can display it directly. Here, you create a PetView with four subviews: an imageView to display the pet’s image and three other labels to display the pet’s name, age and adoption fee. You create and position each view within init(frame:). Lastly, you throw a fatalError within init? (coder:) to indicate it’s not supported. let image = UIImage(named: "stuart")! First, you created a new Pet named stuart. Next, you created a viewModel using stuart. Next, you created a view by passing a common frame size on iOS. Next, you configured the subviews of view using viewModel. Finally, you set view to the PlaygroundPage.current.liveView, which tells the playground to render it within the standard Assistant editor. To see this in action, select View ▸ Assistant Editor ▸ Show Assistant Editor to check out the rendered view. 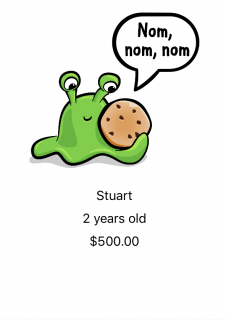 What type of pet is Stuart exactly? He’s a cookie monster, of course! They’re very rare. You’ll use this method to configure the view using the view model instead of doing this inline. This is a neat way to put all of the view configuration logic into the view model. You may or may not want to do this in practice. If you’re only using the view model with one view, then it can be good to put the configure method into the view model. However, if you’re using the view model with more than one view, then you might find that putting all that logic in the view model clutters it. Having the configure code separately for each view may be simpler in that case. Your output should be the same as before. Hey Stuart, are you going to share that cookie? No? Aww, come on…! MVVM works well if your app requires many model-to-view transformations. However, not every object will neatly fit into the categories of model, view or view model. Instead, you should use MVVM in combination with other design patterns. Furthermore, MVVM may not be very useful when you first create your application. 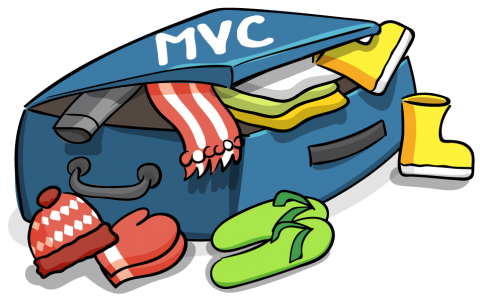 MVC may be a better starting point. As your app’s requirements change, you’ll likely need to choose different design patterns based on your changing requirements. It’s okay to introduce MVVM later in an app’s lifetime when you really need it. Don’t be afraid of change — instead, plan ahead for it. 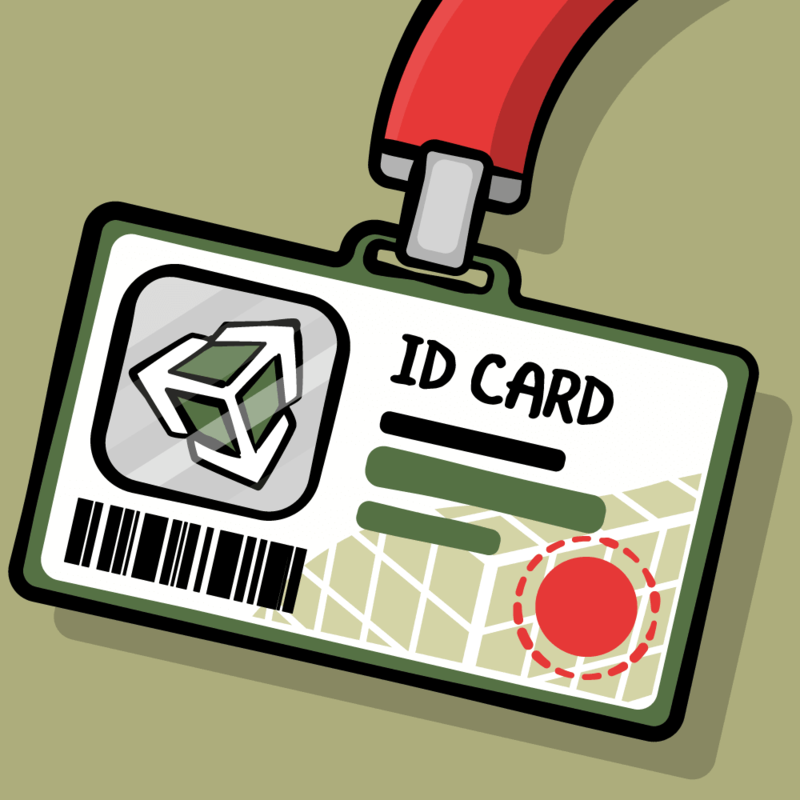 Throughout this section, you’ll add functionality to an app called Coffee Quest. In the starter directory, open CoffeeQuest/CoffeeQuest.xcworkspace (not the .xcodeproj) in Xcode. 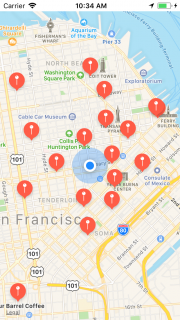 This app displays nearby coffee shops provided by Yelp. It uses CocoaPods to pull in YelpAPI, a helper library for searching Yelp. If you haven’t used CocoaPods before, that’s okay! Everything you need has been included for you in the starter project. The only thing you need to remember is to open CoffeeQuest.xcworkspace, instead of the CoffeeQuest.xcodeproj file. 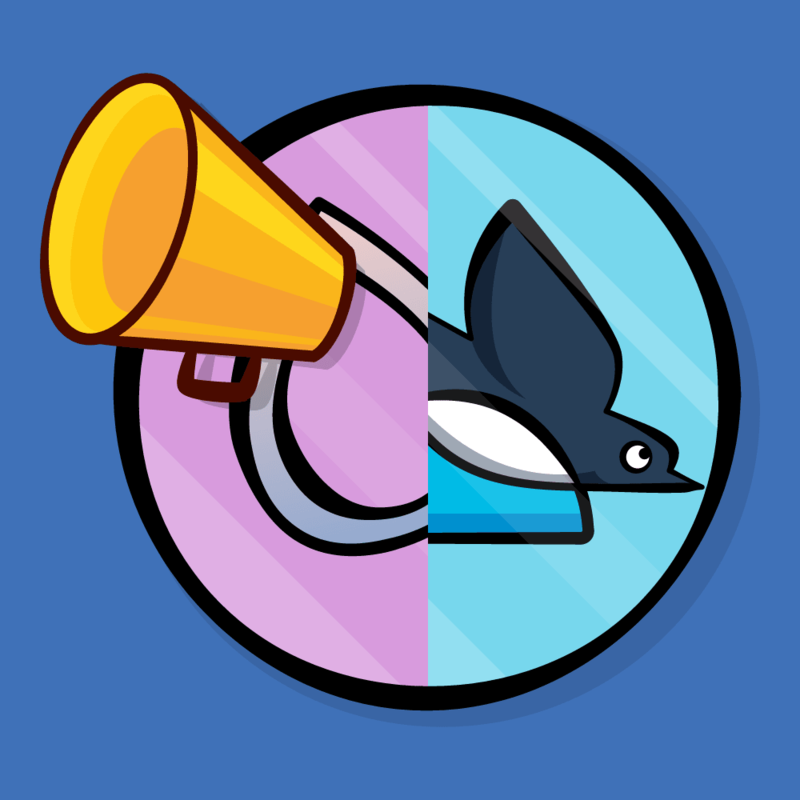 Note: If you’d like to learn more about CocoaPods, read our free tutorial about it here: http://bit.ly/cocoapods-tutorial. 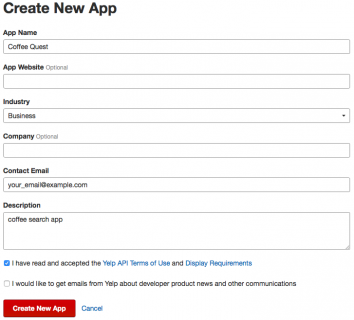 Before you can run the app, you’ll first need to register for a Yelp API key. 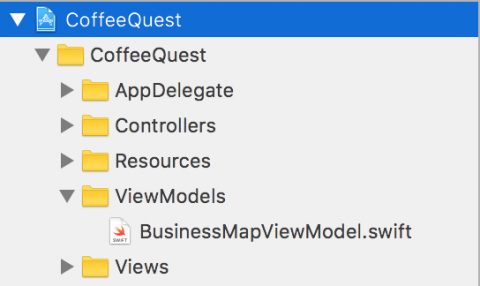 Copy your API key and return to CoffeeQuest.xcworkspace in Xcode. Open APIKeys.swift from the File hierarchy, and paste your API key where indicated. Build and run to see the app in action. The simulator’s default location is set to San Francisco. Wow, there’s a lot of coffee shops in that city! Note: You can change the location of the simulator by clicking Debug ▸ Location and then selecting a different option. These map pins are kind of boring. Wouldn’t it be great if they showed which coffee shops were actually good? Open MapPin.swift from the File hierarchy. MapPin takes a coordinate, title, and rating, then converts those into something a map view can display… does this sound familiar? Yes, it’s actually a view model! First, you need to give this class a better name. Right click on MapPin at the top of the file and select Refactor ▸ Rename. Enter BusinessMapViewModel for the new name and click Rename. This will rename both the class name and file name in the File hierarchy. Next, select the Models group in the File hierarchy and press Enter to edit its name. Rename this to ViewModels. BusinessMapViewModel needs a few more properties in order to show exciting map annotations, instead of the plain-vanilla pins provided by MapKit. You’ll use image instead of the default pin image, and you’ll display ratingDescription as a subtitle whenever the user taps the annotation. You accept image via this initializer and set ratingDescription from the rating. This tells the map to use ratingDescription as the subtitle shown on annotation callout when one is selected. Now you can fix the compiler error. Open ViewController.swift from the File hierarchy and scroll down to the end of the file. Build and run your app. It should now look... the same? What gives? The map doesn’t know about image. Rather, you’re expected to override a delegate method to provide custom pin annotation images. That’s why it looks the same as before. This simply creates an MKAnnotationView which shows the correct image for the given annotation, which is one of our BusinessMapViewModel objects. Build and run, and you should see the custom images! Tap on one, and you’ll see the coffee shop’s name and rating. 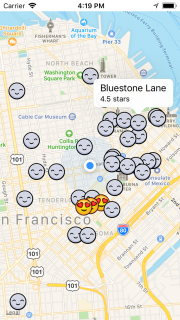 It appears most San Francisco coffee shops are actually 4 stars or above, and you can find the very best shops at a glance. You learned about the MVVM pattern in this chapter. This is a great pattern to help combat massive view controller syndrome and organize your model-to-view transformation code. However, it doesn’t completely solve the massive view controller problem. Doesn’t it seem odd the view controller is switching on rating to create view models? What would happen if you wanted to introduce a new case, or even an entirely different view model? You’ll have to use another pattern to handle this: the Factory pattern. 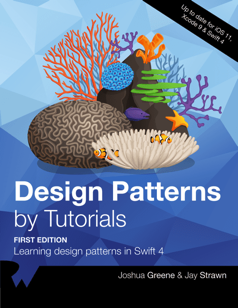 If you enjoyed what you learned in this tutorial, why not check out the complete Design Patterns by Tutorials book, available on our store in early access? Design patterns are incredibly useful, no matter what language or platform you develop for. Using the right pattern for the right job can save you time, create less maintenance work for your team and ultimately let you create more great things with less effort. Every developer should absolutely know about design patterns, and how and when to apply them. That's what you're going to learn in this book! Move from the basic building blocks of patterns such as MVC, Delegate and Strategy, into more advanced patterns such as the Factory, Prototype and Multicast Delegate pattern, and finish off with some less-common but still incredibly useful patterns including Flyweight, Command and Chain of Responsibility. And not only does Design Patterns by Tutorials cover each pattern in theory, but you’ll also work to incorporate each pattern in a real-world app that’s included with each chapter. Learn by doing, in the step-by-step fashion you’ve come to expect in the other books in our by Tutorials series. 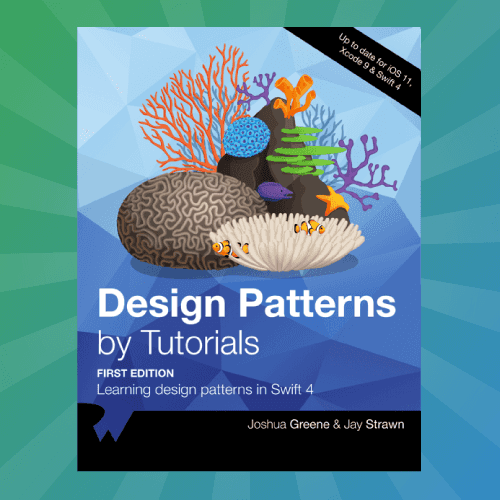 To celebrate the launch of the book, it’s currently on sale as part of our Advanced Swift Spring Bundle for a massive 40% off. But don’t wait too long, as this deal is only on until Friday, April 27. If you have any questions or comments on this tutorial, feel free to join the discussion in our forums at https://forums.raywenderlich.com/c/books/design-patterns!